I actually played The Banner Saga quite awhile ago, possibly several months ago. The reason I stopped was because I was stuck on the final boss battle. I tried several times in vain to complete the game but all of them ended in disaster. I thought, maybe I'll take a break from the game and come back when I had a level head or whenever Stoic patches it to make the final battle somewhat easier. It wasn't until today that I finally decided to give the final battle a go again. Stoic did make the battle slightly easier but it still wasn't enough. Ultimately, I swallowed my pride and set the difficulty to "Easy" and... the battle was a cakewalk. So now that I've finally completed the game, it's time to review it. Also, despite how late this review is it's probably a good time to examine the game considering only last month a trailer was released revealing that the sequel would be available sometime this year. This means I can not only answer the question "Is it worth buying The Banner Saga?" but also "Do you think it would be worth buying its sequel?" The story of The Banner Saga is set in a Viking-inspired fantasy world where an ancient evil race known as the Dredge surface and are trying to bring an end to life as we know it. You will get to play as two groups of people that eventually meet with each other just before the game's finale. One group consists of mainly Varl (who are giants with ram-like horns) and the other human refugees from a village in the far east of the continent. Both of these groups go on long, arduous treks and the many people, towns and enemies you'll encounter during your perilous treks make up the story. Up until the end of the game (more of that later) I really enjoyed the huge world that Stoic imagined, the in-depth history, the many characters (some with dubious morals) and the many ethical dilemmas you face on your journey. It makes for an engrossing story and what they've got here is a great basis for future adventures. Which is of course what they intend to do when they release the sequel this year, right? The game is basically two games strapped together. One part of it is inspired by the likes of the classic edutainment title, The Oregon Trail where you have to lead a wagon train of explorers across the United States to settle in the north-west. Across the way you could lose members of your group to such things as the measles, exhaustion and even dysentery (which became a popular meme associated with the game). 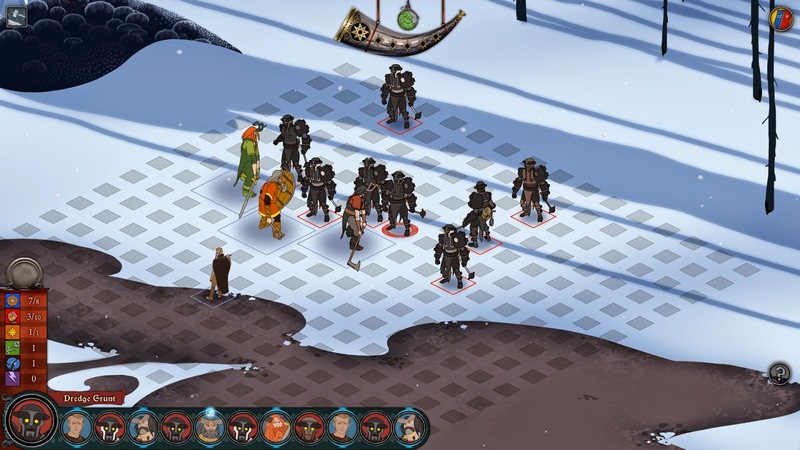 Similarly, in The Banner Saga you'll come across several ethical dilemmas and challenges as your caravan makes the long trek towards its destination. It's your job to balance morale, supplies and renown in order to keep as much of your caravan alive and happy, or so you're led to believe. Occasionally you'll need to fight enemies and this is the second part of the game. Combat is resolved using turn-based tactics in a game that is similar to Battle Chess except each of your units have strength, armour and willpower bars, along with some special abilities. Strength represents the unit's hitpoints as well as how much damage they do when they attack. Armour represents how much damage the unit can take or deflect: the lower your armour score, the easier it is for the enemy to do more damage. Finally, willpower is used to amplify damage or for any special abilities. While I don't really have any issues with the way combat works what I do have an issue with is the fact nowhere do they really place emphasis on how important combat really is. At first, I thought that was a good thing - you see it's possible to lose almost every battle in this game and still carry on with the story. Sure, you may have lost a potential ally or lost some supplies or had something else bad happen to your party, but ultimately, life goes on. I thought that was great and seemed more realistic (I mean you win some, you lose some right?). Unfortunately it turns out being good at combat becomes very important and this only becomes apparent right at the end. You see, during the final boss battle there's a huge difficulty spike. As mentioned before, Stoic even made the part leading to the final battle slightly easier: usually you have to rest your troops for days if they're injured but Stoic made it so you didn't need to for the final battle. However this doesn't matter because in the end the battle is just so much more difficult than any other battle you would've fought until then that you will not be prepared for it - unless you've been practising combat in the meantime or have won every battle in the game - then maybe you've got a chance. Or you've been playing the game on Easy difficulty. As I said earlier, the game was a cakewalk when I dropped the difficulty down. On Normal difficulty I usually lost four of my six party members during the first part of the battle and the big bad boss would often hit my guys with 12 damage per hit. Considering most characters have around 8-18 hitpoints, you can see that it's quite painful! When I dropped the difficulty, I lost none of my six party members during the first part, the big bad boss only did 1 damage per hit and there were only half the minions too. This means there's a huge gulf between Easy and Normal difficulty so while I'd normally just recommend to stick with Easy, the other battles leading up to the final one must be ridiculously simple in comparison. The worst revelation after all of this though is that all that trekking you did for 95% of the game is inconsequential as it doesn't actually affect the ending of the story at all (as you would expect from a typical role-playing game or a game developed by ex-Bioware developers) - all that matters is surviving long enough for the final battle and one of two choices you make before the battle will determine which ending you receive. There's no voice acting for the majority of this game (save for the introductory cinematic) but sound effects are used well to make the environments feel alive (or at least very cold) and make the combat sound life-like. Austin Wintory has already become a legend as a video game composer with the likes of Journey, Monaco and even Leisure Suit Larry: Reloaded. He once again truly shines with this soundtrack providing an epic, Norse-inspired soundtrack to rival Jeremy Soule's work on Skyrim. Particular favourites of mine include the main theme We Will Not Be Forgotten, No Tree Grows to the Sky and the sombre ending track We are all Guests upon the Land. It's a pity that as I type this Austin Wintory has been threatened with expulsion from the American Federation of Musicians for his work on The Banner Saga. A special mention must go to the excellent vocalists on this soundtrack, YouTube sensations Peter Hollens and Malukah. I've heard some of their other work before including an excellent collaboration where both of them performed Christopher Tin's Baba Yetu (theme song for Civilization IV). There's a beautifully crafted introductory cutscene done in a similar style to Eyvind Earle's work (e.g. Disney's "Sleeping Beauty" cartoon) as well as Don Bluth and Ralph Bakshi but alas it's the only time you'll really see any proper animations: the rest of the game employs still visual novel/comic book style artwork, which is very good mind you, although I would've liked to see more animated cutscenes if it were possible. While I enjoyed 95% of the game (and mainly because of its epic narrative, glorious visuals and spectacular soundtrack) the final battle was a bitter disappointment thanks to the huge difficulty spike. Even the patch that Stoic applied didn't help since while it meant the party you brought into the battle was stronger, the battle itself remained unchanged. What you also realise when you finish the game is that nothing really mattered up to that point. All the people you meet on the way have little bearing on the overall plot and ultimately the majority of the game is just ensuring you survive for the final battle and that's it. It's a numbers game no more - this isn't a true role-playing game experience. If you manage to like the game though, playing again will give you the ability to hunt down some more Steam achievements as well as generate those lucrative trading cards. No real complaints about bugs or the interface - I mean the interface is just a very simple mouse-driven point 'n' click interface (just the way I like it). 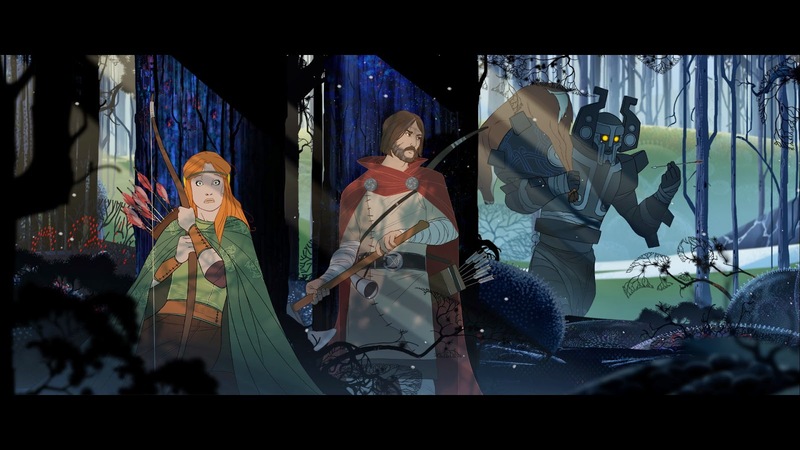 While The Banner Saga is an incredibly pretty game with a stirring soundtrack, the gameplay leaves a lot to be desired. In fact, I would've preferred it if they just made the game into a visual novel since at least they would've been able to introduce multiple endings dependent on character interactions. Ultimately, it's just a numbers game and 95% of the game is inconsequential. All that matters is how well you do in the very difficult final battle and that's it. Would I recommend people to buy this game? Only if you're really good at turn-based tactics games or you appreciate a beautifully crafted but almost linear story (just be sure to play it on Easy difficulty if you're not used to strategy games). Would I purchase the sequel? Only if Austin Wintory is doing the soundtrack since I'm not going to lie, his soundtrack is probably one of the only reasons I ended up buying The Banner Saga in the first place.